The American Heart Association recommends all adults have their cholesterol levels checked regularly—ideally, once per year. 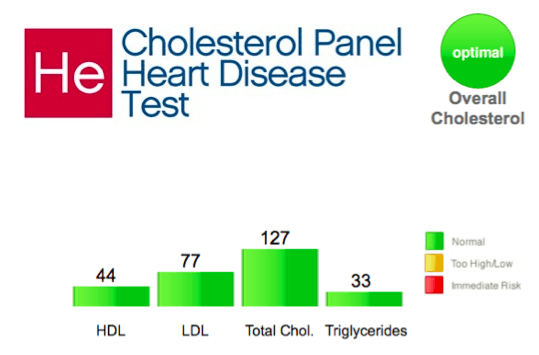 That’s why BioIQ includes a complete cholesterol/lipid panel as an essential part of its population health screening programs. Your lab report depicts your cholesterol levels in milligrams per deciliter of blood (mg/dL). Let’s look at each item in turn. Cholesterol is a waxy, fat-like (lipid) substance found in every cell in the body. The body uses cholesterol to form cell membranes, aid in digestion, convert Vitamin D in the skin, and develop hormones. High Density Lipoprotein (HDL) cholesterol is considered “good cholesterol” because it removes excess cholesterol from the bloodstream and the artery walls and transports it back to the liver for metabolism. Low Density Lipoprotein (LDL) cholesterol is considered “bad” cholesterol because it contributes to plaque—a thick, hard deposit that can clog arteries and make them less flexible. LDL carries needed cholesterol to all parts of the body, but too much LDL in the system can lead to coronary artery disease. Triglycerides are the most common type of fat found in the body. They are produced in the liver from the food we eat. The body converts excess calories into triglycerides, which are stored in your fat cells until they are needed for energy. If you haven’t had a complete health screening in the last year, contact your wellness administrator or healthcare professional to schedule a simple blood test to learn these critical health metrics—then take action to improve them if necessary. To determine how your cholesterol levels affect your risk of heart disease, you must also take into account other risk factors such as age, weight, waist circumference, family history, smoking, and blood pressure. We will look more closely at these factors in an upcoming post.